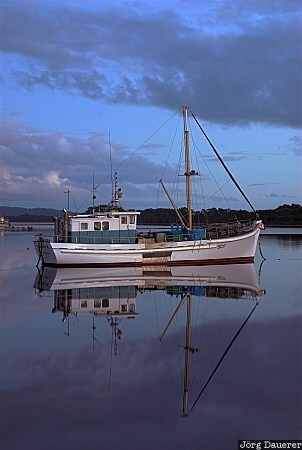 A boat and its reflexions after sunset in Letters Bay, Macquarie Harbour near Strahan, Tasmania, Australia. This photo was taken in the evening of a sunny day in April of 2007. This photo is part of the exhibition Fishing Boats (October 2009). This photo was taken with a digital camera.